The present invention relates to a cell apoptosis inducer containing chlorine dioxide. The present invention relates to a cell apoptosis inducer kit containing the following two independent components: the first component: a chlorine dioxide precursor solid, or a solution containing a chlorine dioxide precursor; and the second component: an auqeous solution of an acidity pH adjuster; the two components are stored separately, and can be mixed before use so that in-situ reaction occurs and the cell apoptosis inducer containing chlorine dioxide is prepared; and the amounts and concentrations of the first component and the second component enable the pH of the mixed solution to be 1.5-6.5. The present invention further relates to use of the cell apoptosis inducer containing chlorine dioxide or the cell apoptosis inducer kit containing chlorine dioxide in preparing drugs for treating tumors, or use thereof in preparing anti-aging drugs for target tissues of mammals, or use thereof as cosmetics, or use thereof in preparing chemotherapeutic drugs. The present invention belongs to the field of cancer treatment and aging, particularly by induction of senescence relates to cells and tumor cell apoptosis, thus a method of treating cancer and aging, as well as for the preparation of chlorine dioxide in a mammalian apoptosis-inducing agents or cosmetic application of the drug. Aging of the body is not equivalent to senescent cells, but the former is the result of the accumulation, so aging body to some extent can be used to characterize the percentage of senescent cells. Total body cell senescence and death continuously, while another cell proliferation produce new cells to compensate. If the proliferation of new cells produced only full complement of cell death, but also to replace part of senescent cells, so the body on the performance of the younger. Studies have shown that: Lifetime clear senescent cells, can delay age-related phenotypes time originally appeared. Moreover, in his later years there have been clear will delay the development of age-related disorders. This suggests that senescent cells can indeed cause age-related phenotype, and their clearance can prevent or delay age-related tissue function loss (Baker DJ, et al.Clearance of p16Ink4a-positive senescent cells delays ageing-associated disorders. Nature, 2011,479: 232-236). It can be said, clearing senescent cells, reducing the proportion of senescent cells, the body will be able to show the younger, and can prevent or delay age-related loss of tissue function. Senescent cell death is essentially apoptosis. (HWEM Xiang et al., "Free Radical and apoptosis", "Biochemistry and Biophysics", 1996; 23:12). Aging does not mean dying, if the medium was changed regularly, senescent cells can still be long-term survival (Seshadri T, Campisi J.Repression of c-fos transcription and an altered genetic program in senescent human fibroblasts.Science, 1990 Jan 12; 247 (4939): 205-9). However, senescent cell proliferation inhibition is irreversible growth arrest in the G1 phase of the cell cycle, can not enter S phase. This suggests that anti-apoptotic ratio of senescent cells may actively proliferating young cells, thereby maintaining the long-term survival (Huang Ying, Zhangzong Yu Tong Tan Jun, "human aging to apoptosis in fibroblasts can be induced," "Chinese Journal of Geriatrics", 2000 June 19 No. 3). Therefore, in theory, find the idea of ​​an anti-aging, namely by inducing apoptosis of senescent cells, senescent cells promote apoptosis, dying, so be purged from the body. Machine experience autostart Stem cell regeneration to regenerate new cells to replace cells are cleared, so that the body rejuvenation. Conscious of senescence-induced apoptosis, it is to remove senescent cells the most appropriate way of thinking. Remove excess during embryonic development by apoptotic cells and completed the mission, to ensure the normal development of the embryo; remove cell aging and disease by apoptosis in the adult stage, to ensure the health of the body. For example, studies in mice was found, when the old young stem cells placed in a microenvironment, they can be rejuvenated (Rescuing replication and osteogenesis of aged mesenchymal stem cells by exposure to a young extracellular matrix Yun Sun, et al. The FASEB Journal, May 2011, vol.25 no.51474-1485), i.e. younger, said regeneration ability. From a further aspect appreciated tissue to remove senescent cells, because the presence of space-specific induction, tissue stem cells the automatic regeneration, tissue regeneration more youthful, and therefore the overall performance of the body younger. There are many studies indicate that apoptosis contributes to the body's aging delay associated with loss of tissue function. For example, DNA fragmentation is characteristic signs of apoptosis, DNA double strand breaks (DNA double-strand breaks) in the rat brain activity change indicates the relationship: Fracture such DNA molecules, but also even in a completely healthy neurons in mice will occur in the process of the mouse brain in the new environment, the DNA breaks speed legacy environment are those that stay immobile mice six times (Elsa Suberbielle, et al.pHysiologic brain activity causes DNA double-strand breaks in neurons , with exacerbation by amyloid-βNature Neuroscience 16,613-621 (2013)). Obviously mouse memory and thinking ability to adapt to the new environment of stronger, suggesting that the apoptotic process DNA double-strand breaks can promote brain younger mice. Autophagy promotes the ultimate degradation of apoptotic cells, is the final step in cell senescence clean. Autophagy increased antiaging effect (Louis R.Lapierre, et al.The TFEB orthologue HLH-30 regulates autopHagy and modulates longevity in Caenorhabditis elegans, Nature Communications.4, Article number: 2267). Factors that can cause cell apoptosis can cause oxidation. Through the study of macrophages and monocytes, Albina also put forward NO apoptosis inducing agent (Albina JE, Cui S, Mateo RB et al.Nitric oxide-mediated apoptosis in murine peritoneal macropHages.J Immunol, 1993 Jun1 ; 150 (11): 5080-5). Nitric oxide (NO) has on the treatment of many diseases of aging, such as nitric oxide ,, has abnormal neurons of Parkinson's disease leading to a role in preventing, nitric oxide which promotes the decomposition of waste protein served to protect the role of nerve cells (Kentaro Ozawa, et al.S-nitrosylation regulates mitochondrial quality control via activation of parkin Scientific Reports 3, Article number:. 2202 (July2013) mechanism of this nitric oxide appears to alleviate diseases of aging is to promote aging apoptosis. But in reality it did not discover how to safely and easily targeted elimination of senescent cells, leaving the body rejuvenation technology. Application No. 201110102598.1 of Chinese patent "rosewood extract and nitric oxide combination of skin care products" mentioned: Nitric oxide itself promote skin regeneration, aging resistance to good effect, but also increase the effective ingredients for traditional skin cosmetics absorb. Patent Application No. 201210499300.X "a promoter mammalian stem cells and methods of application of chlorine dioxide in the mammalian stem cells for the manufacture of a medicament start", there are chlorine dioxide for activating stem cells to facilitate regeneration, but not mention of how to make their rejuvenation mechanism by clearing senescent cells, and no drugs or cosmetics can be used in anti-aging applications. Although the patent mentioned mechanism based on stem cell regeneration chlorine dioxide treatment of some diseases of old age, but did not give more programs in the prevention of these diseases. The root causes of aging and cancer are the same (Carlos López-Otín, et al.The Hallmarks of Aging.Cell, 6 June 2013). Induction of tumor cell apoptosis has become an important way to treat cancer. If tumor cells treated as senescent cells, the tumor cell apoptosis by inducing the idea to treat tumors and to induce apoptosis by anti-aging old idea is the same. Tumor cells typically have some mechanism of apoptosis resistance, the use of an apoptotic mechanism of tumor therapy for the equilibrium that is pro-apoptotic and anti-apoptotic in the regulation of apoptosis in each level is altered, induces apoptosis. Although research on the mechanism of apoptosis in the past decade has been great progress, but can exact a detailed explanation of apoptosis, in particular, the mechanism of apoptosis in mammalian cells is not much, the classical pathway is now generally accepted in the following two Article: receptor pathway and mitochondrial pathway of death. Tumor cells for specific pH environment, studies have shown that sodium bicarbonate, the pH increased tumor suppressing spontaneous tumor metastasis (Ian F.Robey, et al.Bicarbonate Increases Tumor pH and Inhibits Spontaneous Metastases Cancer Res March 15,200969; 2260 ), but which itself is not formed in the induction of apoptosis of tumor cells. Conventional tumor cell apoptosis inducing agent has the following disadvantages: no clear targeting, side effects, treatment complex and high certainty, will cause the resistance of tumor cells, only valid for a few types of cancer cells. If the induction of apoptosis of tumor cells is correct idea of ​​treating tumors, the need to find more targeted, less toxic side effects, are more universal apoptotic inducer. Chlorine dioxide is internationally recognized as a new generation of highly efficient, broad-spectrum, safe sterilization, preservative, is the best alternative to chlorine preparations, it has been widely used in the developed world. Relevant organizations United States, Western Europe, Canada, Japan and other developed countries such as the US Environmental Protection Agency, the Food and Drug Administration, US Department of Agriculture have approved and recommended chlorine dioxide for disinfection of food, food processing, pharmaceuticals, hospitals, public environment, etc. , mildew and food preservation and so on. World Health Organization (WHO) and the World Food Organization (FAO) has also chlorine dioxide as a disinfectant and efficient A1-level security. Water is generated in the control of "three-induced substance" (carcinogenic, teratogenic, mutagenic) in European and American countries has been widely used substitute chlorine dioxide for chlorine disinfection of drinking water. But chlorine dioxide as the drug has not yet been accepted by the market. However, some patents involve the use of chlorine dioxide for cosmetic or treatment of a disease (e.g., CN102137651A, CN101641104A and CN1199633C, US5750108, CN102441006A), these patents are not yet found chlorine dioxide, or an acidic solution containing chlorine dioxide It has the potential to remove senescent cells. A first aspect, the present invention relates to apoptosis-inducing agent comprising chlorine dioxide. In one preferred embodiment, the apoptosis-inducing agent comprising chlorine dioxide dissolved in water, wherein the chlorine dioxide concentration is 500-2900ppm, based on the calculated mass. An inorganic acid or a salt thereof selected from the group consisting of hydrochloric acid, collection of the phosphoric acid, boric acid, metaphosphoric acid, pyrophosphoric acid, sulfamic acid, dihydrogen phosphate, hydrogen phosphate. Most preferably, wherein the pH adjusting agent is selected from citric acid, acetic acid or dihydrogen phosphate. A third aspect, the present invention relates to the use of the above apoptosis inducing agent comprising chlorine dioxide or said inducer of apoptosis kit comprising chlorine dioxide for the preparation of a drug-induced apoptosis. Preferably, the cell is a mammalian cell. A fourth aspect, the present invention relates to the use of the above apoptosis inducing agent comprising chlorine dioxide or said inducer of apoptosis kit comprising chlorine dioxide for the preparation of a medicament for the treatment of tumors, or for the preparation of a mammalian target tissue use of anti-aging drugs or as a cosmetic purposes, or for the preparation of chemotherapeutic agents. Based on the study of the prior art, an object of the present invention is the use of chlorine dioxide to provide a pharmaceutical or cosmetic preparation for mammalian cell apoptosis inducing agent. According to this application, anti-aging drugs or cosmetics have an apoptosis inducing agent containing chlorine dioxide used in the pharmaceutical or cosmetic capable of removing senescent cells in the target tissue and promote the regeneration of the body, the young tissue regeneration, in order to achieve anti-aging effect. The application has little or no side effects. Another object of the present invention is the use of chlorine dioxide to provide a medicament for the mammalian apoptosis-inducing agent. According to this application, a mammalian tumor cell apoptosis in drug has an apoptosis inducing agent containing chlorine dioxide, the drug can be targeted to specifically induce apoptosis of tumor cells, tumor therapy to achieve better results, and it has little or no side effects, less burden on the patient. To achieve the above object, the technical solution of the present invention uses: an apoptosis inducing agent containing chlorine dioxide preparation and administration of said inducer of apoptosis is a mammalian target tissue of step, wherein said apoptosis inducing agent is providing an effective amount of chlorine dioxide when administered to a mammalian target tissue. Further, a method for preparing an apoptosis inducing agent containing chlorine dioxide to: chlorine dioxide gas is dissolved in an acidic pH adjusting agent, a pH of 1.5 to 6.5 A in an acidic solution, prepared in 500 ~ 2900 ppm of chlorine dioxide solution. Further, a method for preparing an apoptosis inducing agent containing chlorine dioxide are: chlorine dioxide precursor is dissolved in water to prepare a 1% to 40% aqueous solution, this aqueous solution containing an acidic pH adjusting agent in an acidic solution B adjusting the pH of the mixed solution is 1.5 to 6.5. Further, a cell apoptosis inducing agent of the kit is prepared containing chlorine dioxide: chlorine dioxide precursor is dissolved in water to a concentration of 1% to 40% aqueous solution C; acidic pH adjusting agent is dissolved in water D prepared acidic solution; before using the mixed solution C, D, pH adjusted mixed solution is 1.5 to 6.5. Still further, the chlorine dioxide precursor is sodium chlorite, potassium chlorite, chlorite, lithium chlorite, calcium chlorite, magnesium chlorite and barium. Still further, an acidic pH adjusting agent is citric acid, acetic acid or sodium dihydrogen phosphate. Further, an apoptosis inducing agent by intraarterial injection, intramuscular, subcutaneous, intracardiac, intrathecal, intraarticular injection, needle injection, rectal administration, nasal administration, transdermal administration or administration by inhalation manner directly to the organ or tissue injury or give to other target tissues. Further, an apoptosis inducing agent may be prepared as injectables, ointments, inhalants, nasal drops, lotions, suppositories, patches, pastes, tablets, oral liquid, capsules, granules, granules, pills, or syrups. The present invention provides a pharmaceutical preparation for the chlorine dioxide in the chlorine dioxide in the manufacture of a mammalian apoptosis-inducing agents, and cosmetic applications, wherein, for the pharmaceutical or cosmetic anti-aging mammalian target tissue, it younger. Further, this includes anti-aging, skin rejuvenation that is, skin care, and other body tissues young people, such as increased memory, improve sleep therapy, prevention of Alzheimer's disease, Parkinson's disease, osteoporosis, diabetes, cardiovascular and cerebrovascular age-related diseases and other diseases, including but not limited to these. Still further drugs, for the preparation of chlorine dioxide in the mammalian apoptosis-inducing agents, and cosmetic applications, wherein the medicament is for anti-aging body tissues, and the prevention of Alzheimer's disease, Parkinson's disease, bone osteoporosis, diabetes, cardiovascular disease and other age-related diseases and the like; the cosmetic skin care for the skin, acne or acne removal, may also be used mouthwash oral care, including but not limited to these. The present invention also provides the use of chlorine dioxide in the manufacture of medicament for inducing apoptosis in mammalian cells, wherein the medicament is for the treatment of cancer, particularly mammalian tumor cell apoptosis is induced. Intracranial metastases, meningiomas, tumors of the skull, brain, pituitary adenomas, acoustic nerve sheath tumors, glioma, brain tumor; maxillary sinus cancer, laryngeal cancer, nasopharyngeal cancer, tongue cancer, thyroid cancer, gum cancer lip cancer; thymoma, lung carcinoma, adenocarcinoma, sarcoma, breast, lung metastases, breast fibroids, breast cancer; pancreatic cancer, stomach cancer, gallbladder cancer, colorectal cancer, pancreatic cancer, esophageal cancer, colon cancer, liver cancer; pelvis cancer, penile cancer, urothelial cancer, prostate cancer, urethral cancer, testicular cancer, bladder cancer, Wilms tumor, renal cancer; ovarian cancer, fallopian tube cancer, vulvar cancer, vaginal cancer, uterine cancer, cervical cancer, choriocarcinoma cancer, pelvic cancer; skin cancer, liposarcoma, malignant teratoma, fibroma, neurofibroma, melanoma, cholangiocarcinoma, squamous cell carcinoma, basal cell carcinoma; chordoma, osteoma, cartilage tumors, osteosarcoma, synovial sarcoma, giant cell tumor, fibrosarcoma of bone; acute leukemia, malignant lymphoma, chronic leukemia; hemangiomas, islet cell carcinoid, neuroblastoma, myxoma, neck cancer metastasis, cardia. They include, but are not limited to these cancers. Further, the present invention is chlorine dioxide in the manufacture of a medicament inducing apoptosis in mammalian cells, the application of the medicament may be administered at risk of developing cancer, diagnosed with cancer or cancer treatment period is at individual subjects during recovery after cancer treatment, or the drugs can be administered as a prophylactic agent of the subject individual to prevent or delay the development of cancer. DETAILED DESCRIPTION The following embodiments of the present invention will be further described. The present invention is defined as apoptotic cell death, degradation and cleared without a strict distinction between whether apoptosis (apoptosis), necrosis (necrosis) or autophagy (autophagy). Inducing tumor cell apoptosis and senescence in cells of the present invention refers to induce a senescent cell death, degradation and death of tumor cells and clearance, clearance and degradation, without careful study of the manner and process of death. DETAILED DESCRIPTION Before describing embodiments of the present invention, firstly the mechanism of the present invention provides a method will be described. The specific embodiments described combined skilled in the art will contribute to understand the technical solutions and scope of the present invention. Studies have shown that: Lifetime clear senescent cells, can delay age-related phenotypes time originally appeared. Moreover, in his later years there have been clear will delay the development of age-related disorders. This suggests that senescent cells can indeed cause age-related phenotype, and their clearance can prevent or delay age-related loss of tissue function. (Baker DJ, et al.Clearance of p16Ink4a-positive senescent cells delays ageing-associated disorders.Nature, 2011,479: 232-236). It can be said, clearing senescent cells, reducing the proportion of senescent cells, the body will be able to show the younger, and can prevent or delay age-related loss of tissue function. Senescent cell death is essentially apoptosis. (HWEM Xiang et al., "Free Radical and" "Progress in Biochemistry and Biophysics", 1996; 23: 12). Autophagic promote degradation of apoptotic cells, so it can play a role in clearance of senescent cells. The study found that memory loss can be reversed flies by eating foods rich in polyamines. Hey eat flies and other polyamines can enhance the life of the organism. It seems to play a role of autophagy by reversing age-related decline. Autophagy refers to cells used to clear the debris of the mechanism itself. By gene technology or calorie restriction increase autophagy, it can extend the life of fruit flies. (Varun K Gupta, et al.Restoring polyamines protects from age-induced memory impairment in an autopHagy-dependent manner.Nature Neuroscience, 01 September 2013). ROS can induce high levels of apoptosis (Lau AT, Wang Y, Chiu JF.Reactive oxygen species: current knowledge and applications in cancer research and therapeutic.J Cell Biochem.2008 May 15; 104 (2): 657-67) . Studies have shown that when the nematode bacterial nitric oxide production for food, life significantly prolonged (Ivan Gusarov, et al.Bacterial Nitric Oxide Extends the Lifespan of C.elegans Cell, Volume 152, Issue 4,818-830,14 February 2013) . This suggests the oxide can promote apoptosis. Although antioxidant effective as standard anti-old has always existed, but in reality, very little evidence to support. If you can not timely removal of defective proteins, it will lead to the loss of homeostasis within the protein, causing age-related conditions. For example, in Alzheimer's disease, you can not remove the proteins form plaques, leading to neuronal death. Although the number of free radicals may be harmful, but their presence will trigger a protective response. There is no evidence that genetics can explain and enhance the body's antioxidant defense can delay aging. (Carlos López-Otín, et al.The Hallmarks of Aging.Cell, 6 June 2013). In some embodiments, the present invention also demonstrated a strong oxidizing agent (chlorine dioxide) may promote cell apoptosis, and contribute to rejuvenation of the body. On the other hand, the prevalence of acidification cell growth factor-dependent cell apoptosis during intracellular acidification is a change in the intracellular signaling of the apoptotic process, the fact that it has the following aspects to promote apoptosis supported: ①-specific Na + / H + exchange inhibitor by inhibiting the Na + / H + exchanger acidified can induce apoptosis in cells, in addition to Na + / H + exchanger, Na + -HCO 3 - collaborative transportation with Cl - / HCO 3 - exchanger changes are also closely related with apoptosis, dose-response relationship between the degree of acidification of the cytoplasm and cell apoptosis rate; ② pure alkali treatment by reducing the level of intracellular acidification exhibit against induced apoptosis inducing agent; ③ memory cell enzyme in the nucleic acid, intracellular acidification activates the enzyme, the trigger nucleosomal DNA cleavage, the enzyme is an important material basis acidification mediated apoptosis cells; ④ many activity and apoptosis-related enzymes and proteins enhanced in an acidic environment (side XIAO Hai et al., "Advances in intracellular pH value in apoptosis" and "Changzhi Medical College" 2004 4). Creatine (Creatine) in biochemistry, organic acid is a naturally occurring nitrogenous vertebrates, it is possible to provide the auxiliary energy muscle and nerve cells. We found that oral administration of creatine can improve G93A transgenic mice (amyotrophic lateral sclerosis) body performance and extend the life of this kind of action exhibit dose-effect relationship, but also protects mice motor neurons and substantia nigra neurons damage (Klivenyi P, et al.Neuroprotective effects of creatine in a transgenic animal model of amyotropHic lateral sclerosis..Nature Medicine.1999.mar, 5 (3): 347-350). The study also found that lipoic acid (lipoic acid) can slow down the aging process. L- ascorbic acid generally considered anti-aging effects in their antioxidant capacity. However, in 2009, important experiments conducted by Michael Risto laboratory Jena University in Germany showed that ROS to maintain the basic functions of the liver is essential. Experimental results show that, by increasing physical exercise from the mitochondria (energy producing intracellular minute organs, production principal portion via redox chains) ROS generated electron transport chain within the system, to prevent the occurrence of diabetes type Ⅱ. However, if at the same time taking antioxidants vitamin C and vitamin E every day, exercise no positive results. February 2009 issue of "Clinical Nutrition" published an article on the review, summarized 22 randomized double-blind controlled study published in the total number of participants up to hundreds of thousands, and concluded there was no support for "antioxidants prevent coronary artery disease "argument. And a review "Journal of the American Medicine" published in February 2007 to combat more antioxidant health care products. A total of 68 studies involving more than 230,000 summarize, analysis of several antioxidants have no effect on mortality. If we exclude those who study the quality is not high, only high-quality studies totaling more than 18 million people participated in the 47 analyzed, then these types of antioxidants, even a small increase in mortality. Accordingly, the present invention is that, L- ascorbic acid in its anti-aging effects. More acidic substances beauty. For example, 30% of salicylic acid as a drug high concentration of chemical peels, and can reach the same 70% dilute acid skin pigmentation spots, narrow pores, remove fine wrinkles and improve the aging effects caused by the sun and many other . Skin care is to make the skin younger, it can generally be concluded that the acid can remove senescent cells, promoting younger skin regeneration. Dose and high-dose treatment group citric acid caused apoptosis in mouse testis cells (Wang Yanjie: effects of citric acid on apoptosis in mouse testis [D]; Henan University of Science and Technology: 2012). The inventors conjecture, L- ascorbic acid, creatine, lipoic acid and other acidic substances can be anti-aging effect, because it is more acidic character can be accelerated senescence apoptosis, thereby causing the body younger. The inventors have surprisingly found that, with the chlorine dioxide solution has a higher oxidation potential and can be supplemented with acidic anti-aging environment. In some embodiments, the present invention is demonstrated by tests, help to improve the acidic environment of chlorine dioxide formulation apoptosis of a cell. In various embodiments of the present invention, we employed an acidic chlorine dioxide solution administration targeting the target tissue, the target tissue can be demonstrated rejuvenation. Tumor cells have ten characteristics: self-sufficiency in growth signals (Self-Sufficiency in Growth Signals); anti-growth signals insensitive (Insensitivity to Antigrowth Signals); resistance to cell death (Resisting Cell Death); unlimited potential of replication-competent (Limitless Replicative Potential); sustained angiogenesis (sustained angiogenesis); tissue invasion and metastasis (tissue invasion and metastasis); avoid immune destruction of (avoiding immune Destruction); promote tumor inflammation (tumor promotion inflammation); cellular energy abnormalities (Deregulating cellular Energetics) ; genomic instability and mutations (genome instability and mutation). Hanahan D, Weinberg RA.Hallmarks of cancer: the next generation.Cell.2011 Mar 4; 144 (5): 646-74). If it resistant to inhibition of cell death that is induced apoptosis in tumor cells, to a large extent suppress the occurrence of cancer. From the logic, the tumor cells not normal cells, the body's own natural should inhibit them, i.e. these cells should automatically apoptosis, apoptosis reason about its own characteristics does not occur. The study found that some cancers may not be entirely attributed to genetic damage, but tell them to bypass the senescent cells stop growing due to the switch, there is behavior between aging and cancer cells show similar, if senescent cells manage to escape death , they have the potential to become a cancer (Hazel A.Cruickshanks, et al.Senescent cells harbour features of the cancer epigenome, Nature Cell Biology (2013)). The new view is that the root causes of aging and cancer are the same (Carlos López-Otín, et al.The Hallmarks of Aging.Cell, 6 June 2013). The inventor tumor cells treated as senescent cells, it was supposed to apoptosis. Therefore, the inventors believe that, because the tumor cells have some special ability is not allowed to apoptosis, and long-term retention in the body. For two characteristics of tumor cells may be the best way to eliminate tumors. The two features is that resistance to cell death and abnormal cell energy. Reference senescence-induced apoptosis idea is equally applicable to tumor cells. Although the tumor cells has its own characteristics, the presence of cancer patients is generally due to the tumor cells do not automatically organism environmental effects of death, but normal cells, tumor cells themselves change with respect to, oxides such as fear more and more acidic environment afraid . By oral sildenafil children with cystic lymphangioma in Example 3, by treatment, 3 children with significant tumor volumes were reduced (Glenda L.et al.Swetman, Sildenafil for Severe LympHatic Malformations N Engl J Med 2012; 366: 384-386 January 26,2012). Sildenafil is 5 phosphodiesterase inhibitors, phosphodiesterase NO-cGMP pathway is a negative regulatory factor, sildenafil can be thus releasing the biologically active substance by nitric oxide. Accordingly, the present invention is such that nitric oxide plays a direct role in tumor suppression. In experiments on melanoma and breast cancer found that nitroglycerin can enhance the general chemotherapy drugs to kill cancer cells (Barsoum IB by the production of nitric oxide, et al.Hypoxia induces escape from innate immunity in cancer cells via increased expression of ADAM10: role of nitric oxide.Cancer Res.2011 Dec 15; 71 (24): 7433-41). Pro-prodrug to release nitric oxide, induced breast cancer cell death, while preserving normal mammary epithelial cells (Vanity McMurtry, et al.JS-K, a nitric oxide-releasing pro-drug, induces breast cancer cell death while sparing normal mammary epithelial cells, International of journal of oncology, Published online on: Tuesday, January 25,2011, Pages: 963-971). Generally it agreed that a high concentration of nitric oxide synthase expression, tumor cells can inhibit the growth of toxic effects (Xu W, et al.The role of nitric oxide in cancer.Cell Res.2002 Dec; 12 (5-6 ): 311-20). Cell proliferation experiments showed, 400μmol / L, 800μmol / L, 1600μmol / L different degrees of cytotoxic in vitro in Hela cells, up to 89.0%. After hydrogen peroxide treatment, the rate of cell senescence and active oxygen with the hydrogen peroxide concentration level rises higher, exhibit dose-effect relationship. Conclusion: the hydrogen peroxide has a significant cytotoxicity to Hela cells, can induce senescence and production levels of Reactive Oxygen. Cancer and senescent cells, as more rely on glycolysis hypoxia way to provide energy. As early as 80 years ago discovered glucose metabolism in tumor cells than normal cells strong, and even in aerobic glycolysis is dependent on conditions, a phenomenon known as "Warburg effect" on the cell membrane of tumor cells and the mechanism glucose transporter (Glut) function active, and hexokinase activity enhancement. Results "Warburg effect" is a cell to produce a large number of products of glycolysis - lactic acid. From a large number of sugar off H + did not like the aerobic oxidation of water through the respiratory chain is oxidized, a large amount of aggregate will face H + pH (pHi) and acidified threat occurrence of apoptosis in cells, tumor cells and enhanced secretion of acid pHi inner cell function is maintained, but the surrounding normal host cells will adversely affect. "Warburg effect" tumor cell tumor cells produce more acid than normal cells, detection of tumor cells but pH was found intracellular pHi values ​​no significant difference compared with normal cells, and extracellular pH (pHe), and acidic intracellular vesicles pH in (PHV) significantly lower than normal cells, suggesting that tumor cells have a strong acid secretion related. (Izumi H, Torigoe T, Ishiguchi H, et al.Cellular pH regulators: potentially promising molecular targets for cancer chemotherapy.Cancer Treat Rev, 2003,29 (6): 541-549). In order to avoid the toxicity of an acidic microenvironment, tumor cells were then discharged outside the hydrogen ions, the alkaline environment and eventually produce an acidic environment within the extracellular cells. Tumor cells by upregulating cell membrane transporter associated hydrogen ion, such as sodium hydrogen exchanger (Na + / H +), Na + / K + -ATPase, the vesicle-type H + -ATPases, H + / CI - symporter and monocarboxylate transporter (MCT) and the like, to achieve this mechanism (Harguindey S, et al.The role of pH dynamics and the Na + / H + antiporter in the etiopathogenesis and treatment of cancer.Two faces of the same coin- -one single nature, [J] .Biochim BiopHys Acta, 2005,1756 (1): 1-24). Accordingly, the invention determines if the tumor cells by increasing the pressure so that reduce acid secretion, it will cause the pHi decreased the tumor cells to acidosis, thereby inducing apoptosis. And increase the pressure, even if the tumor extracellular environment pH (pHe) decreases, so that the transport of proton pump H + ions of tumor cells to increase the pressure, and eventually collapse. Literature support more acidic environment capable of inducing apoptosis of tumor cells. For example, acidic environment, through p53-mediated induction of human gastric cancer cell lines and apoptosis (AC Williams, et al.An acidic environment leads to p53 dependent induction of apoptosis in human adenoma and carcinoma cell lines: implications for clonal selection during colorectal carcinogenesis, Oncogene.1999May 27; 18 (21): 3199-204). Experiments show that: administering to a pH of AGS cells in vitro acidic environment 6.0, such acidic extracellular environment so that the H + ion concentration, Na NHE -1 may inhibit tumor cells + -H + exchange function so excessive intracellular glycolysis H + ions can not be discharged intracellular environments have been significantly acidified alkaline, then it plays the extracellular environment to change the role of gastric cancer, but also changed the intracellular environment. This acidification of gastric cancer cells suitable external environment changes its intracellular growth and proliferation of environmental pH, whereby a substantial fraction of gastric cancer cells stop proliferation (Gao Yan et al., And acid within its measurement "of AGS intracellular pH environment proliferation and apoptosis, "" modern biomedical progress ", 2008 09). Rich IN line and the other proved peripheral lymphoid leukocytes obtained from blood of leukemia cells in a patient with widespread than normal hematopoietic cells, high pH statistically significant. It illustrates the existence of a direct relationship between the intracellular pH and normal hematopoietic cells and leukemic cells cycle regulation. With this relationship, they inhibitor with Na + / H + exchanger 5- (N, N-hexamethylene) -amiloride (HMA) treated leukemia cells, reducing the intracellular pH value, thereby inducing apoptosis. (Rich IN, Worthington-White D, Garden OA, Musk P.Apoptosis of leukemic cells accompanies reduction in intracellular pH after targeted inhibition of the Na + / H + exchanger.Blood.2000,15,95 (4): 1427 ~ 1434) . In one embodiment of the present invention, we employed an acidic chlorine dioxide solution administration targeting tumor cells, the tumor cell apoptosis, and as reinforcing acidic environment, a corresponding increase tumor cell death. Those skilled in the art and are understood by the acidic environment of strong oxidants damage to normal cells, i.e., an acidic chlorine dioxide solutions on normal cells accelerate apoptosis. However, the present inventors believe that damage to normal cells of the body will stimulate regeneration of stem cells, thus completely general damage can be repaired; Further, aging or cancer cells are cell dysfunction, oxidant or they resist apoptosis-inducing acidic environment ability weaker. Accordingly aspect of the present invention is a clear and fewer side effects targeting of an anti-aging or anti-cancer art. In some embodiments, the present invention demonstrates an acidic chlorine dioxide formulation having a stronger apoptosis-inducing effect on tumor cells or senescent cells, but with less damage to normal cells, or that such damage is irreparable extent can be . Method 1: pH adjusting agent added to the water to prepare an acidic aqueous solution pH of 1.5 to 6.5. By normative, and the concentration of chlorine dioxide gas produced in the manner of preparation 99.9% chlorine dioxide gas (preferably the chlorite is reacted with an acid). Bubbled and dissolved to prepare 500 to 2900ppm of chlorine dioxide solution to the acidic aqueous solution by the chlorine dioxide gas. The solution used in the present invention, prior to use, it should be dark airtight preservation, and has been kept at a relatively low temperature state 4 ℃ ~ 15 ℃. The method of preparing chlorine dioxide-containing formulation does not have to be a solution, to ensure that only a role to play in the target tissue when administered to a target tissue material is primarily chlorine dioxide and certain acidic environment. Method 2: The chlorine dioxide precursor is dissolved from 1% to 40% aqueous solution was prepared in water. Added to the aqueous acidic solution containing a pH adjusting agent (preferably 2% to 50% citric acid solution), pH of the mixed solution is adjusted to 6.5 1.5. The solution used in the present invention, prior to use, it should be dark airtight preservation, and has been kept at a relatively low temperature state 4 ℃ ~ 15 ℃. The method of preparing chlorine dioxide-containing formulation does not have to be a solution, to ensure that only a role to play in the target tissue when administered to a target tissue material is primarily chlorine dioxide and certain acidic environment. Chlorine dioxide precursors comprising a number of parts combination may be made as follows: The chlorine dioxide precursor is dissolved in an aqueous solution of 1% to 40% in water was prepared, which is a first solution; prepared acidic solution with a pH adjusting agent ( preferably from 2% to 50% citric acid solution), which is the second solution. Prior to use in the present invention is the use, on-site mixing the above solution, the final pH of the mixed solution was adjusted from 1.5 to 6.5, chlorine dioxide to be produced after the reaction, the solution was applied to the target tissue. The method of preparing chlorine dioxide-containing formulation does not have to be a solution, to ensure that only a role to play in the target tissue when administered to a target tissue material is primarily chlorine dioxide and certain acidic environment. As chlorine dioxide precursors can be used in the present invention may include alkali metal chlorite, alkali earth metal chlorite. As the alkali metal chlorite includes, for example sodium chlorite, potassium chlorite, lithium chlorite; as alkali earth metal chlorite include, for example, calcium chlorite, magnesium chlorite, ethylene barium perchlorate. Wherein, not only, but also from the viewpoint of availability from the viewpoint of excellent sustained activity of chlorine dioxide, preferably sodium chlorite, potassium chlorite, and more preferably sodium chlorite. As the pH adjusting agent can be used in the present invention, any acid having a buffering property can be well used. As the organic acid or its salt include formic acid, acetic acid, propionic acid, butyric acid, lactic acid, pyruvic acid, citric acid, malic acid, tartaric acid, gluconic acid, glycolic acid, fumaric acid, malonic acid, maleic acid , oxalic acid, succinic acid, acrylic acid, crotonic acid, glutaric acid and their salts. Examples of the inorganic acids include hydrochloric acid, phosphoric acid, boric acid, metaphosphoric acid, pyrophosphoric acid, sulfamic acid and the like. Examples of the inorganic salts, and examples thereof include dihydrogen phosphate (sodium salt, potassium salt, the same below), a mixture of dihydrogen phosphate and hydrogen phosphate salts and the like. pH adjusting agents may be used alone, or two or more may be used in combination. Use in the human body from safety considerations, pH adjusting agent is preferably citric acid, acetic acid and sodium dihydrogen phosphate, and more preferably is citric acid. Further, the chlorine dioxide solution to a final pH is preferably from 1.5 to 5.5, more preferably 1.5 to 3.5. Apoptosis inducing agent containing chlorine dioxide present invention is preferred as a solution. Dose apoptosis inducing agent in the cells of the invention due to age, body weight, condition of the patient and the nature of the disease varies. However, in the case of an adult, for example, 1 mg to 5000 mg per day chlorine dioxide, preferably from 1 mg to 1000 mg per day chlorine dioxide. Apoptosis inducing agent containing chlorine dioxide in the present invention may be administered in various ways. Apoptosis inducing agent containing chlorine dioxide can be administered systemically, such as by intravenous, intraarterial, or intraperitoneal administration; local lesion may be administered directly, the method can be directly administered by the transdermal, puncture or the like the affected area of ​​administration. The mode of administration of apoptosis-inducing agent of the present invention comprising chlorine dioxide, to reach the intended route of administration may be by any of a tissue, for example, via intravenous drip, intravenous injection, intraarterial injection, intramuscular injection, subcutaneous injection, intradermal injection, intracardiac injection, intraperitoneal injection, intrathecal injection, intraarticular injection, needle injection, rectal, sublingual, nasal, percutaneous administration, inhalation or topical administration to a target organ or tissue, etc., but are not limited to these. When administered in the above manner, depending on the size of the target tissue, the effective amount of an apoptosis inducing agent in the cells of the invention daily 0.1 ~ 500mg / kg of chlorine dioxide, and sometimes more easily expressed in terms of the target tissue area, the present apoptosis inducer effective range in the invention is 0.1 ~ 500mg per day chlorine dioxide / 100cm 2, when the dose is administered at least 10 days effective. In any case, an apoptosis inducing agent containing chlorine dioxide according to the present invention, only for the target to ensure that the effective dose of chlorine dioxide in a suitable manner into the target tissue, induce apoptosis play a role, but not limited to in any form, manner and procedures, and to help other auxiliary substances. Any formulation of "Chinese Pharmacopoeia General formulation" in the dosage form can be a apoptosis inducing agent in the cells of the invention. The method of the present invention as an apoptosis-inducing agents Examples of dosage forms for drugs include in vivo direct injection (including suspensions, emulsions); ointments (including oleaginous ointments, emulsion ointments (creams), water-soluble ointment etc. ), inhalants, liquid formulations (including eye drops, etc. ), suppositories, patches, pastes, lotions and other external preparation; or tablets (including dragees, film, gel coat), a liquid formulation , capsules, granules, powders (including fine particles), pills, syrups, troches and the like. These formulations can be prepared according to General method for preparation of the Chinese Pharmacopoeia. In addition, administration of apoptosis-inducing agents Shihai method of the present invention may include solid or liquid carriers may be pharmaceutically acceptable material or intervention. As a solid or liquid pharmaceutically acceptable carriers may include solvents, stabilizing agents, solubilizing agents, emulsifying agents, suspending agents, buffers, isotonic agents, coloring agents, bases, thickeners, excipients, lubricants , binders, disintegrating agents, coating agents, flavoring agents, conditioning agents, foaming agents, superabsorbent polymer, a surfactant, a penetration enhancing agent and pH adjusting agent, but not limited thereto. Specific examples include deionized water, lactose, sucrose, fructose, glucose, mannitol, sorbitol and other sugar or sugar alcohol; crystalline cellulose, methyl cellulose, ethyl cellulose, hydroxypropyl cellulose, low substituted hydroxypropyl propyl cellulose, hydroxypropylmethyl cellulose, hydroxypropyl methylcellulose phthalate, hydroxypropyl methylcellulose acetate succinate, carboxymethyl cellulose, hydroxymethyl cellulose cellulose calcium, sodium carboxymethyl cellulose, crosslinked sodium carboxymethyl cellulose, hydroxymethyl ethyl cellulose, cellulose acetate phthalate and related derivatives; maize starch, wheat starch, rice starch , potato starch, cyclodextrin, pullulan and the like doing something related derivatives; agar, sodium alginate, gum arabic, gelatin, collagen, shellac, tragacanth gum, xanthan gum and the like hot day polymer (alginic , plant mucilage, proteins and the like); polyvinylpyrrolidone, aminoalkyl methacrylate copolymer, methacrylic acid copolymer, hydroxy vinyl copolymer, polyvinyl alcohol, dimethylpolysiloxane and other synthetic polymers ; olive oil, cocoa butter, brown Brazil Wax, beef tallow, hardened oil, soybean oil, sesame oil, camellia oil, linseed oil, paraffin, liquid paraffin, yellow beeswax, white petrolatum, coconut oil, microcrystalline wax and other oils and fats; stearate, aluminum stearate, fatty acids, calcium stearate, magnesium stearate, triethyl citrate, triethyl glycerides, medium chain fatty acid triglyceride, stearyl, isopropyl myristate, and the like and derivatives thereof; ethanol, glycerin, hard tallow alcohol, cetyl alcohol, propylene glycol, polyethylene glycol, and polyols; zinc oxide, calcium hydrogen phosphate, precipitated calcium carbonate, synthetic aluminum silicate, silicic acid anhydride, kaolin, dried aluminum hydroxide gel, synthetic hydrotalcite, titanium oxide, talc, bentonite, magnesium aluminum silicate, potassium aluminum sulfate, gallic views inorganic substance and the metal salt compound, bismuth, bismuth subsalicylate, calcium lactate, sodium citrate, sodium chloride, sodium hydrogen carbonate and the like; sucrose fatty acid esters, polyoxyl stearate, polyoxyethylene hydrogenated castor oil, polyoxyethylene polyoxypropylene glycol, sorbitan monooleate times with trioleate, sorbitan monostearate sorbitan esters, sorbitan palmitate but Alcohol esters, esters of sorbitan monolaurate, polysorbate, glyceryl monostearate, sodium lauryl sulfate surfactant, lauromacrogol and the like; dimethyl sulfoxide and the like, Azone compounds, pyrrolidone derivatives, fatty acids and alcohols permeation enhancer compound; pigments; perfumes. But it is not limited to these. Examples of interventional therapy materials include syringes, stents, artificial blood vessels, puncture syringes, catheters, balloons and the like, but not limited thereto. Apoptosis inducing agent containing chlorine dioxide in the present invention prior to administration, can be administered in accordance with the mode of administration and anesthetics, such as barbiturates and other injectable anesthetics, nitrous oxide and other inhalation anesthetics, lidocaine due to anesthesia and other surface like, but it is not limited to these. In the present invention is applied to a mammalian apoptosis-inducing agent, specific examples of mammals include humans, monkeys, dogs, pigs, cats, rabbits, rats and mice. Among them, those who are preferred. The following examples are provided to illustrate the present invention without limiting the invention in any manner. Hypertrophic scars as a function of the affected organ, beautiful disease, the cause of a variety, provided that damage involving the deep dermis damage, are likely to produce hypertrophic scars. Fibroblasts generally considered insufficient apoptosis is the cause of hypertrophic scars produced (Ogawa, R.The most current algorithms for the treatment and prevention of hypertropHic scars and keloids [J] .Plast Reconstr Surg, 2010,125: 557-568) . Common sense suggests, the same size of the wound, as opposed to the young, the elderly wound healing is slow and easy to leave scars. Thus, the formation of hypertrophic scars can be understood as a phenomenon of skin aging, through the induction of fibroblast apoptosis may be a good method for scar healing of skin. Hypertrophic scars in patients with a total of 6 cases, 5 males and 1 female, mean age 42 years. This study consisted of four groups: (a radius of the central 2/3) scar central portion (inner peripheral radius 1/3) scar edge portion surrounding skin scar (keloid from the inner edge of the range of 0.5cm), patients with other parts of the scar normal skin. Fibroblasts: The specimens taken after the grouping as described above excised epidermis and subcutaneous tissue under sterile conditions, cut into approximately 1mm 3 will block preparations were in a small amount of fetal calf serum, at 37 ℃, 5% CO 2 culture 4-6h under saturated humidity, the tissue mass to adhere to the wall of the bottle, followed by addition of 15% fetal bovine serum containing DMEM (dulbecco's modified eagle medium) medium amount, 3-4 days for solution 1, 2 -3 weeks after confluent primary cells and covered sheet, passaged every 3-5 days 1, 6-8 experiment passage cells. Configured with deionized water at a concentration of 7.47% sodium chlorite and a mixed solution of 1.59% sodium chloride to prepare a first solution; configured with deionized water at a concentration of 16.7% citric acid solution, a second solution was prepared . The same volume were taken from different parts of the container of the solution was mixed, the mixed solution was still waiting for 3-5 minutes, then double 0.22μm membrane filter, diluted with deionized water to prepare various concentrations of chlorate dioxide solution. Cells were plated factors applied to different treatment to induce apoptosis. A bottle of each group were taken and cells in the logarithmic growth phase were seeded in 6-well cell culture plate, cells are seeded in each group one hole (1 × 10 5 cells / well) in each plate were inoculated plates 6 24 wells, and cultured at 37 ℃, 5% CO 2 and saturated humidity 48-72h, until the cells covered bottom of the hole, wherein a plate taking, the medium was aspirated, washed with Hank solution (a balanced salt solution) after addition of DMEM medium without fetal bovine serum, 3 plates were another solution containing chlorine dioxide formulations, the final concentration reaches 100ppm, 1000ppm, 2900ppm, taking a plate added FasMcAb (Fas mAb), so that a final concentration of 1μg / ml, an additional plate without applying any processing factors, cultured for 24h after the detection rate of apoptosis. PI staining, flow cytometry comparing the apoptosis rate of the composition. After above treated cells were harvested in 10ml centrifuge tubes, 1000r / min centrifugal 10min, after pre-cooled PBS (phosphate buffered solution) was added 70% ethanol wash over the 4 ℃ fixed overnight, and then low-speed centrifugation 10min, washed with PBS after the cells were resuspended by adding RNase a 2μl (20mg / ml) in the remaining cell suspension is 0.5ml, the immediate effect of RNase a into an ice bath to stop after 37 ℃ for 30min, then add 500μl PI dye (100μg / ml) dark incubated 30min, disperse cells, the 300 mesh screen filtration rate of apoptosis in the DNA analysis cells were detected by flow cytometry. All the cells in each group by serum-free culture after 24h which have different degrees of apoptosis rate increased, but each group were compared after growth in serum-free cultured cell apoptosis was significantly higher than found in normal skin keloids edge portion (P <0.01), whereas the surrounding skin keloids and keloid central portion interposed therebetween, and the difference was not significant (P groups> 0.05, table 1). This shows that aging is seen as scar tissue has significant anti-apoptotic ability, so the scar tissue not only can not be cleared automatically, but will hyperplasia. FasMcAb act to lower apoptosis rate is significantly higher than normal skin surrounding the scar and fibrous skin fibroblast cell apoptosis (P <0.01, Table 2). This also shows the scar tissue has anti-apoptotic ability. Under the action of chlorine dioxide formulation, four constituent fibers apoptosis rate with increasing the chlorine dioxide concentration gradient gradually increase, the increase was significant (P <0.01, Table 3). This shows that the formulation of chlorine dioxide in the acidic environment has a significant effect on apoptosis of hypertrophic scar tissue. Configured with deionized water at a concentration of 7.47% sodium chlorite and a mixed solution of 1.59% sodium chloride to prepare a first solution; configured with deionized water at a concentration of 16.7% citric acid solution, a second solution was prepared . The same volume were taken from different parts of the container of the solution was mixed, the mixed solution was still waiting for 3 to 5 minutes, then a 0.22μm filter membrane bilayer. Preparation of a formulation of chlorine dioxide. Use of chlorine dioxide in two or more agents for treatment of hypertrophic scars, once directly with chlorine dioxide formulation, a second time plus the same amount of dimethylsulfoxide. I.e. directly applied scar twice with an interval of 30min, continuous smear 15 days. Immediately after treatment dark red hypertrophic scars, the scar surface yellowish gray to see dot-like dander vaporized uniformly distributed, no bleeding, exudate. After the first day of treatment, wounds see dried red dot crusting, then to the fifth day after treatment, the wound treatment was bright red, wound crusts fall off gradually. And twenty days after the treatment, the wound healed completely, all the crusts fall off, while the center of the scar observed papillae height becomes flat, the skin was smooth and scar some pigmentation. 25 days after treatment, fresh skin generator having a smooth, in about 40 ± 20 days, an irregular shape of the original scar completely flat. Before removing treatment, after treatment IH, after 2 days, 7 days, 14 days, 28 days scars, cut scars full thickness, cut tissue in 4% paraformaldehyde after routine dehydration, embedded in paraffin, sectioned trailing HE staining microscopic groups each period fibroblast morphology, density, arrangement of collagen fibers, capillary proliferation case, TUNEL (Terminal deoxynucleotidyl transferase dUTP nick end labeling) method to detect apoptosis rate changes. By TUNEL method, stained areas located in the nucleus. Light microscopy normal fibroblasts nuclei blue, the reaction was negative, the nucleus of apoptotic cells was shades of brown, positive reaction, i.e., apoptotic cells. 40 times the light microscope, each section three randomly selected most positive cells into fibroblasts hpf were counted, anti-positive cells = number of positive cells / total number of (R) cell response rate, the results were averaged. Fibroblasts, keratinocytes, vascular endothelial cells were apoptotic bodies, i.e., apoptotic cells. I.e., immediately after treatment, a significant increase in apoptosis in fibroblasts performance, 1h, 2 days after treatment, 7 days, 14 days, 28 days of treatment apoptotic cells constituent fibers gradually increased each time higher apoptosis rate than before treatment , P value <0.01, statistically significant differences explained. * Represents prior treatment with P <0.01. Thus whether from in vitro culture, or direct treatment, chlorine dioxide showed the formulation of the acidic environment of the present invention can induce apoptosis in tissue wherein insufficient cell apoptosis acceleration, so that the skin young and healthy. For preparing a cosmetic skin care formulation containing chlorine dioxide: configured with deionized water at a concentration of 7.47% sodium chlorite and a mixed solution of 1.59% sodium chloride to prepare a first solution; concentration disposed deionized water 16.7% citric acid solution, a second solution was prepared. The same volume were taken from different parts of the container of the solution was mixed, the mixed solution was still waiting for 3 to 5 minutes, then a 0.22μm filter membrane bilayer. Then adding an equal volume of 90% dimethyl sulfoxide, and then sealed into glass bottles, made for anti-aging skin cosmetic or younger, applied to the skin. Applied to the skin through the female observers using (100) the actual distinction, evaluated according to the following "stickiness or absence of use", "hair feel astringent absence", "presence or absence of movement in the skin." and "presence or absence of wrinkles, sagging (skin stretching sense) effect." From the results (Table 5), chlorine dioxide formulations of the invention have very excellent as a cosmetic skin care effect. Cosmetic use of the present invention prepared in the above example efficacy, efficacy tests carried out in the crowd, the wearer's skin moisture content was observed during use, elasticity, wrinkles, roughness improvement. Selected 30 healthy women and 10 healthy men, smear free to choose the skin location every day for 15 days, before use, 1h, 7 days (after use 1h), day 14 (after use 1h), on day 28 by subjects were evaluated skin condition, including clinical judgment and non-invasive assessment instrument. Clinical evaluation includes the following parameters: the skin moisture content, skin elasticity, skin gloss, skin roughness / smoothness, color uniformity, improvement in fine wrinkles. Non-invasive assessment instrument measuring skin moisture content using a skin moisture meter Corneometer CM820, skin elasticity was measured using the skin elasticity measurement apparatus (Cutometer SEM 575). 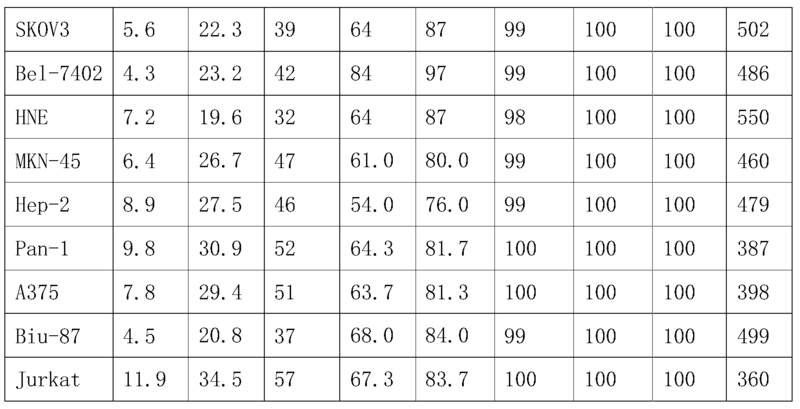 Experimental data are shown in Table 6. From Table 6: After you use this cosmetics, skin moisture content increased dramatically, indicating the product to improve dry skin effect is very obvious, as time goes on day 28, the moisture content of the skin continue to continuous improvement. Larger value is better skin elasticity, skin elasticity better description, it can be seen from Table 6 for 7 days, the skin elasticity was significantly improved, and getting better elasticity between the base value and the difference was significant. Four glossiness index value, the less number of data, the better the improvement described. The results can be seen from the above data, compared with the baseline values, the parameters were improved fitering, significant difference between the base value (the value of the performance decline over time ). Note: * Compared with the baseline values, P <0.01. Thus chlorine dioxide-containing cosmetic of the present invention includes skin care, moisturizing, cream, white skin rejuvenation and wrinkle removal and other cosmetic effect. Acne is a skin problem teenagers often recurrent, mainly due to the aging of the stratum corneum can not promptly removed, clogged pores, leading to fat accumulation, the formation of swelling (acne); after the invasion of acne bacteria infection, redness pustule formation. Since chlorine dioxide is an efficient fungicide per se, it is only guaranteed aging skin cells is cleared, then the chlorine dioxide can treat acne. For the preparation of cosmetic acne (acne treatment) containing chlorine dioxide formulation: Example 2 was prepared, the solution was made acne, acne skin for the applicator. Acne select 30 youth (20 male, 10 female), average age 22 years old, chlorine dioxide formulation containing a day with the above configuration smear acne affected area once, for 5 consecutive days. Specific results are shown below. 30 people acne, with 5 consecutive days, 90% of acne cure. DESCRIPTION chlorine dioxide-containing formulation of the present invention is very effective acne treatment. Chlorine dioxide preparation Formulation: deionized water disposed sodium chlorite concentration of 2.49% and 0.53% mixed solution of sodium chloride to prepare a first solution; concentration configured with deionized water was 5.57% citric acid solution, preparing a second solution. The same volume were taken from different parts of the container of the solution was mixed, the mixed solution was still waiting for 5 to 10 minutes, adding an equal amount of 50% dimethyl sulfoxide, and then double 0.22μm membrane filter, loaded immediately syringe. Preparation time, once. C57BL / 6 male mice were 12 months of age, each mouse cage single feed. 100 mice were randomly divided into two groups: the experimental group (50) and the control group (50). Both groups were sufficient feed and water, since the experimental group 15 months, once a week at a dose of 10ml / kg intravenous formulation of chlorine dioxide prepared by the above method. Details of recording date for each natural death of mice in each group, and the mean life span of mice in each group and the maximum life. The results show: the average life of the control mice was 696.5 days, the average lifespan of the test group of mice was 778.3 days, once weekly injections of chlorine dioxide formulation average 11% of their life prolongation. Description, chlorine dioxide injectable formulation significantly prolong the average life (Table 8). At the current maximum lifetime calculation method commonly used, i.e. the set average life last natural death of 10% of the maximum life of the mice, the results show: the maximum lifespan of control mice was 932 days, the maximum life test mice was 987.5 days injection preparations to make chlorine dioxide maximum life prolongation 5.9%, indicating that: chlorine dioxide injectable formulation has significantly prolonged the life of mice maximum effect. Mice 19 months of age, 10 mice selected at random from the experimental and control groups, respectively, and the balance water maze for endurance tests. Two test time interval of 2 weeks. Water maze test: consecutive training for 3 days before the experiment, 2 times / day. Black square labyrinth water trough is of 50cm × 30cm × 15cm, equipped with the starting area, the blind end of the meander loop 4, security station. Controlling the depth 12cm, water temperature (25 ± 2) ℃. Mouse was put into the inlet end of the start time, the number of hit records automatically blind end, mice climbed to secure the end time for the station, called the incubation period. The incubation period is set up to 120s, 120s screening still can not find an animal more than exports. Balance endurance test: continuous training three days before the experiment, 2 times / day. Between two fixed columns pull a wire having a diameter of 2mm, the distance of 2m, a height of 1m. Lower limb tied with a rope, wire gripping the mice with the upper extremity, is calculated with a stopwatch started to fall gripping time. Observation time was set to 30s, 30s screening fall within the animal. Seen from Table 9, all animals on day 1 was no difference in memory; experimental day 3, 6 and 9 days, an error number and latency of the test group was significantly less than the control group. Visible chlorine dioxide formulation significantly improves the learning and memory in mice. 10 seen from the table, the test mice at 1 day, 3 days, 6 days and 9 days was significantly higher endurance balance. Description of chlorine dioxide formulation significantly improves the ability of the body of the mouse. Experimental data from a plurality of the above embodiment, we can conclude that the formulation of chlorine dioxide under acidic conditions can significantly increase the lifetime of the animal, and concomitant ability to improve memory and body, the mechanism of chlorine dioxide formulation should be capable of inducing senescent cells thereby apoptosis is cleared to senescent cells, the body's own ability to regenerate to restore younger. Thus, the present invention is the preparation of chlorine dioxide formed may be used for cosmetic skin rejuvenation cosmetic, pharmaceutical can also be made for younger body, thereby preventing the occurrence of age-related diseases. Cytotoxicity to A549 human non-small cell lung cancer cells of Example 5 Formulation of chlorine dioxide. Configured with deionized water at a concentration of 7.47% sodium chlorite and a mixed solution of 1.59% sodium chloride to prepare a first solution; configured with deionized water at a concentration of 16.7% citric acid solution, a second solution was prepared . The same volume were taken from different parts of the container of the solution was mixed, the mixed solution was still waiting for 3 to 5 minutes, and then double 0.22μm membrane filter, diluted with deionized water to prepare solutions of different concentrations of chlorine dioxide . 10% PRMI1640 culture containing fetal calf serum and placed 37 ℃, 5% CO2 incubator human non-small cell lung cancer cells A549 cells, every 3 days cells were digested with 0.25% trypsin was passaged and cultured replace liquid. By 0.7 × 10 4 / hole were plated in 96-well plates, placed 37 ℃, 5% CO2 incubator after 24h, respectively, was added a solution of chlorine dioxide, chlorine dioxide solution according to each final concentration of 100ppm, 200ppm, 400ppm , 700ppm, 1000ppm, 1500ppm, 2000ppm, 2900ppm added to negative control group cells was added 0.1% (v / v) in DMSO (dimethylsulfoxide), a separate set of zero (i.e., cells without cell culture well was added only cell culture fluid). Each group of four wells provided, then the 96-well plate counter 37 ℃, 5% CO2 incubator and then cultured 24h, and then the test compound as follows killing effect on tumor cells. By releasing lactate dehydrogenase (LDH) test, using a lactate dehydrogenase assay kit mortality of tumor cells, specific methods of operation in accordance with the instructions of the lactate dehydrogenase assay kit. With assay buffer (Assay Buffer) were resuspended reaction substrate (Substrate Mix). Take 96-well cell culture plates were cultured for 3 replicates of each group 50μl supernatant to a new 96-well plate, each group remaining replicates a final concentration of 0.9% (V / V), Triton -X100 (provided with the kit), and placed in 37 ℃ incubator for 50 minutes to lyse the cells later, 50μl of supernatant was added to take the new 96-well plate, then the new 96-well plate each well was added an equal volume of after resuspension good reaction substrate solution and incubated 30 minutes at room temperature, each well was added Stop solution i.e. 50μl 1M acetic acid (provided in kit) to terminate the reaction, using a microplate reader (490 nm wavelength) of the OD value of each well, cells were lysed hole detected OD value referred to as "OD value cell maximum release", OD value of the negative control group referred to as "natural release control OD value." The OD490 value of the detected rate of cell death calculated according to the following equation, the results are expressed as mean ± standard deviation, and using SPSS software modules calculate the median Probit cytocidal concentration, i.e., IC 50. As shown in Table 10, the formulation of chlorine dioxide can effectively kill A549 cells, and the concentration increases, their cytotoxicity to A549 also dose-dependently increased, calculated by Probit SPSS software module, resulting in chlorine dioxide preparation half effective dose (IC 50) A549 cell death is 495ppm. This example demonstrates embodiment, acidic chlorine dioxide formulation capable of killing tumor cells A549 significantly. Chlorine dioxide formulations are prepared according to the method of Example 5, by the cell culture method of Example 5, the human cervical carcinoma HeLa cells were cultured conservation and seeded in 96 well plates. Example 5 provided a method in the experimental group, control group and the group zero, and by lactate dehydrogenase release assay (of LDH), chlorine dioxide solvent resulting from the detection of the death of HeLa cells, and HeLa cell death is calculated to cause half dose (IC 50). Test Results: As shown in Table 11, the formulation of chlorine dioxide can effectively kill HeLa cells, and with the increase of the concentration of compound, which is killing of HeLa dose-dependently increased, calculated by Probit SPSS software modules dioxide chlorine preparations HeLa cell death leading to half effective dose 405ppm. Example 7: The lactate dehydrogenase release assay, detect chlorine dioxide preparation on a variety of human tumor cells, including breast cancer, ovarian cancer, liver cancer, nasopharyngeal cancer, gastric cancer, laryngeal cancer, pancreatic cancer, melanoma, bladder cancer and killing leukemic cells. Chlorine dioxide formulations are prepared according to the method of Example 5. The method as described in Example 5 Conservation cultured breast cancer cells (MCF-7), ovarian carcinoma cells (SKOV3), hepatoma cells (Bel-7402), nasopharyngeal carcinoma cell (HNE), gastric cancer cells (MKN-45), laryngeal carcinoma cells (Hep-2), pancreatic cancer cells (Pan-1), melanoma cells (A375), bladder cancer (Biu-87), leukemia cells (of Jurkat) uses the same containing 10% FBS PRMI1640, set at 37 ℃, 5% CO2 incubator, according to an ordinary manner for suspension cell culture passaging, which started with centrifugation at passage remove the old medium and add fresh medium. Then the method in Example 5 provided the experimental group, control group and the group zero, and release of tumor cell death by assay of lactate dehydrogenase (of LDH), and resulted in a dose calculated (IC 50) half of the tumor cell death. Test Results: As shown in Table 12, the formulation may be chlorine dioxide effective in killing a variety of tumor cells, and with the increase of the concentration of chlorine dioxide, which is also dose-dependently increased the killing effect of each tumor. Description, acidic chlorine dioxide formulations of the present invention provides a broad spectrum of tumor cell killing effect. Colon cancer cell line LS174T and breast cancer cell lines 1 Cama-cycle both death and cell lines were analyzed. Respectively, under conditions of chlorine dioxide in the absence or presence of 100ppm of chlorine dioxide (prepared by the method of Example 5), the cells were cultured for 48 hours. After pulse with 1μg / ml of bromodeoxyuridine (BrdU) 30 minutes in 70% ethanol to the cells at 4 ℃ fixed overnight, followed by FITC-conjugated anti-BrdU monoclonal antibody and 3μg / ml propidium iodide. Cell death and cell cycle analysis by flow cytometry (FACS). BrdU incorporation is a method of measuring proliferation, whereas propidium iodide stained DNA content may be determined, in particular undergoing apoptosis near diploid cell population. Data show that the percentage of BrdU incorporation of LS174T cells from 27% before the treatment becomes 100ppm of chlorine dioxide present formulation 6% after 48 hours incubation at. In contrast, the percentage of LS174T cells with near diploid DNA content, from 4% before the chlorine dioxide is converted into the formulation the presence of 100ppm of 23% after 48 hours of culture, the apoptosis described 100ppm of chlorine dioxide formulation promoting capacity strong. The data also show that the percentage of Cama-1 cells of BrdU incorporation by 15% before the treatment becomes 100ppm of chlorine dioxide formulation presence of 2% after 48 hours incubation at. In contrast, the percentage of Cama-1 cells with near diploid DNA content, from 4% before the chlorine dioxide is converted into the formulation the presence of 100ppm of 17% after 48 hours of incubation, the preparation of chlorine dioxide showed 100ppm trigger apoptosis . These data suggest that 48 hours of treatment with chlorine dioxide formulation 100ppm, LS 174T stop dividing and Cama-1 cell lines, and undergo apoptosis. To further investigate the role of chlorine dioxide preparation process of the breast tumor cell lines, the Cama-1 cells were analyzed for apoptosis by annexin V staining. Cells were cultured 24 hours in the presence of 400ppm or chlorine dioxide formulation (prepared by the method of Example 5) does not exist. Detection of apoptosis by annexin V staining and flow cytometry. Data show that more than 70% of the Cama-1 cells were annexin V staining further demonstrated 400ppm chlorine dioxide formulation induced apoptosis. Other things being equal, but the preparation of chlorine dioxide by 400ppm pH adjusting agent so that the pH value is improved from 3.5 5.5, only more than 50% Annexin V staining film Cama-1 cells, indicating that contributes to an acidic environment apoptosis rate increase. We also tried kinetic chlorine dioxide induced apoptosis. 500ppm of chlorine dioxide in the presence or absence of the formulation (prepared by the method described in Example 5), pH value 3.5, Cama-1 cells were cultured. After 30 hours, the percentage of detected apoptotic cells (annexin positive cells) in culture. Data show that, after 30 hours, 15% of untreated cells displayed spontaneous apoptosis. However, 80% of cells treated with chlorine dioxide formulations showed cell death. Specifically, Cama-1 cells, nine hours after the preparation of chlorine dioxide was added 500ppm of chlorine dioxide begins induced apoptosis after 30 hours of treatment, 80% of apoptotic cells. Other things being equal, but the chlorine dioxide formulation 500ppm by pH adjusting agent to improve the pH value of 6 3.0, only more than 45% cell death display it, indicating that acidic environment helps improve the rate of apoptosis in cancer cells. We then tried measuring chlorine dioxide preparation on primary human breast tumor cells. Just recovered tumor single cell suspension with PBS or chlorine dioxide (100 ppm) the formulation was incubated for 48 hours. Apoptosis was measured by PI staining. Expressed as a percentage proportion of cells with low DNA content comprising (subG0 / G1 cells), i.e., the ratio of apoptotic cells. Data show that 19.5% having a low content of DNA in cells treated with PBS, and 38.6% of cells treated with chlorine dioxide formulation having a low content of DNA. Thus, the observed similar 100ppm of chlorine dioxide formulation apoptosis against human breast primary tumor cells. Other things being equal, but the preparation of chlorine dioxide by 100ppm pH adjusting agent so that the pH value of 4.5 by the increase value of 6, only 25% of cells treated with chlorine dioxide formulation having a low content of DNA. , Indicating that an acidic environment helps improve the rate of apoptosis in cancer cells. Cytotoxicity test Tumor conjunction with the above, those skilled in the art can determine, acidic chlorine dioxide formulation having a significant killing effect on tumor cells, and this mechanism of chlorine dioxide from an acid formulation significantly induce apoptosis of tumor cells . Configured with deionized water at a concentration of 7.47% sodium chlorite and a mixed solution of 1.59% sodium chloride to prepare a first solution; configured with deionized water at a concentration of 16.7% citric acid solution, a second solution was prepared . The same volume were taken from different parts of the container of the solution was mixed, the mixed solution was still waiting for 5 to 10 minutes, then add 90% of the volume of dimethyl sulfoxide and the like, and then a 0.22μm filter membrane bilayer. Were prepared quantitatively pH = 5 and pH = 100ppm 3.5 of, 500ppm and 2000ppm of chlorine dioxide formulations. 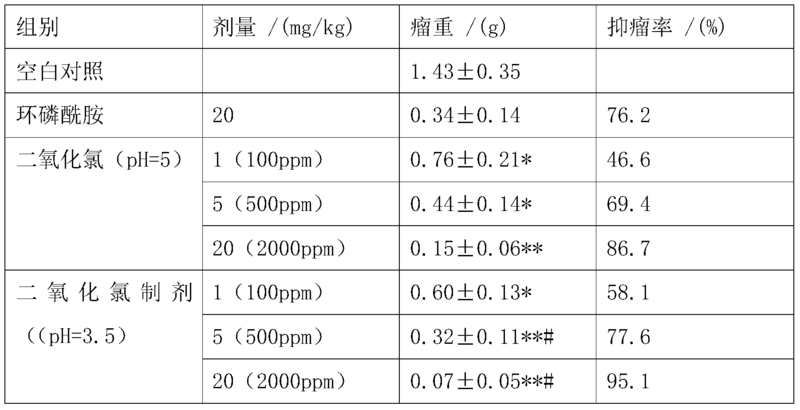 Kunming mice were divided into 8 groups with 15 rats in each group, male and female, were: control group, cyclophosphamide group, chlorine dioxide is low, medium and high dose groups (pH constant at 5), dioxide chloro low dose (pH = 3.5) group, middle dose (pH = 3.5) group and high dose (pH = 3.5) groups. ip dose of cyclophosphamide 20mg / kg, the injection of chlorine dioxide tumor low, medium and high doses of 100 ppm, 500 ppm and 2000 ppm, the control group received normal saline. S180 tumor inoculation mice of each group 24h after dosing volume of 0.1ml / 10g, 1 times / d, continuous 14d. Mice were sacrificed on the 5th withdrawal, and release the tumor mass and the thymus and spleen weighed to calculate the inhibition rate, and thymus and spleen. As can be seen from Table 1, compared with the control group, the formulation of chlorine dioxide (high pH) low, medium and high dose groups, cyclophosphamide chemotherapy group, and chlorine dioxide formulation (low pH) low, , high dose group can significantly inhibit the growth of tumor S180 (P <0.05, P <0.01). Compared with the group of high pH, ​​low pH formulation of chlorine dioxide group can significantly improve the inhibition of chlorine dioxide preparation on S180 tumor growth (P <0.05). As it can be seen from Table 14, compared with the control group, mice cytoxan thymus, spleen index was significantly lower (P <0.01), indicating a high means the side effects of chemotherapy. Chlorine dioxide formulations, thymus and spleen index in high dose group mice are significantly increased (P <0.05). For low pH, chlorine dioxide is not significant. DESCRIPTION chlorine dioxide promote tumor apoptosis in immune organs minimal side effects. Note: * P <0.05, ** P <0.01 compared with the control group. Description, acidic chlorine dioxide formulation provided herein has a significant induction of tumor cell apoptosis, and almost no side effects on the body. Apoptosis inducing agent comprising chlorine dioxide. Apoptosis inducer as claimed in claim 1, which comprises dissolving in water chlorine dioxide in which chlorine dioxide concentration is 500-2900ppm, based on the calculated mass. Apoptosis inducer as claimed in claim 3, wherein said acidic pH adjusting agent selected from citric acid, dihydrogen phosphate or acetate. Apoptosis inducer kit comprising chlorine dioxide 5 or apoptosis-inducing agent as claimed in any one of claims 1-4 1 for the preparation of a pharmaceutical to induce apoptosis. Apoptosis inducing agent or any one of claim 1-4 comprising chlorine dioxide as claimed in claim claim comprising chlorine dioxide apoptosis inducer kit preparation of a medicament for the 5 treatment of tumors, or for preparation of target tissue mammalian anti-aging drug use, or as a cosmetic purposes, or for the preparation of chemotherapeutic agents. Wherein the cosmetic comprises skin whitening, skin water retention, reduce or eliminate wrinkles, increased flexibility, acne, freckle, remove scars or cosmetic skin rejuvenation.